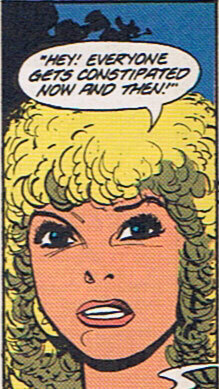 Random Panel: Uummm, thanks for the tip … ? 4 Responses to Random Panel: Uummm, thanks for the tip … ? Yeah! I know! I just now took some Pepto-Bismol! It’s as if she’s yelling at you, forcing you to know that everyone gets constipated! Who’s she speaking to, the Cheesinator? Is that some kind of “stink” effect in the bottom right corner? It’s from “Hollywood Superstars” by Epic from 1990. She’s auditioning for a commercial.